The provost dungeon stands at Charles Town's original wall of 1680-1718. By 1701, Charles Town was surrounded by fortified walls for protection against pirates, hostile Native Americans, Spanish invaders, and wild animals. It was the only British walled city in North America. 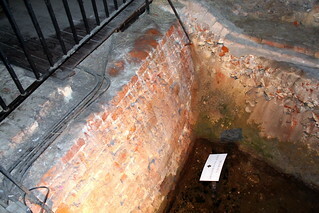 Archaeological excavations under the dungeon floor have exposed the Half-Moon Battery, a semicircular fortification projecting from the seawall. Behind this wall stood the Court of Guard, holding a Council Chamber and jail. In 1767, the top of the seawall was lowered and the Court of Guard demolished, allowing for the construction of the Exchange upon this site.